Pasadena Honda: 2015 Honda Odyssey Full of Features! 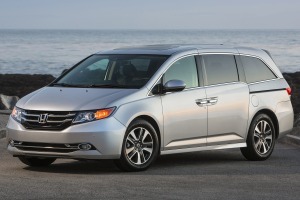 On August 2nd of this year, Honda is releasing the 2015 Honda Odyssey to rave reviews. The new Odyssey comes with some of the same features that people have come to love. The new Odyssey has one a slew of awards based on the construction and the design the new model has. For people who are looking for a luxury van that has competitive pricing, then the 2015 Honda Odyssey can be just the car that they need. Honda of Pasadena wants to point out a few of the features that you can take advantage of when choosing a 2015 Honda Odyssey. One of the biggest benefits of owning an Odyssey is that you will be able to travel around in a vehicle that has great gas mileage. It is very rare that you find a vehicle the size of the Odyssey that gets over 20 miles to the gallon. This will help to save you a lot of money in the long run and will allow you to avoid sacrificing room and style for fuel efficiency. You need to speak with your Honda dealer to assess which series of Odyssey is the best fit for you. Another benefit of buying a 2015 Honda Odyssey is that it will allow you to have all of the room and luxury that you have come to expect from the Honda brand of vehicles. Many people who go out looking for a minivan are looking for enough space to accommodate their family and the Odyssey can offer that in spades. Instead of settling for a smaller and less equipped minivan from a competitor company, you need to take advantage of the room that is offered by the 2015 Honda Odyssey. Yet another benefit of getting a new Honda Odyssey is that it is priced very reasonably, which is great for a car owner on a budget. The best way to find the best price on your new van is by checking around to the dealerships in your area to get a quote. The more you know about what is out there in regards to dealerships, the better equipped you will be to find the right deal on the Odyssey that you want. If you are in need of a good deal on a 2015 Honda Odyssey, then look no further than Honda of Pasadena. They will be able to get you the best deal on the van that you need. You can call them or visit their website for more information. This entry was posted in 2015 Honda Models, 2015 Honda Odyssey and tagged 2015 Honda Odyssey by Honda Pasadena. Bookmark the permalink.